Fasig-Tipton Kentucky Winter Mixed Sale Catalog. Fasig-Tipton has cataloged an initial 47 entries for its 2019 Kentucky Winter Mixed Sale supplemental catalog, which may now be viewed online. Fasig-Tipton will continue to accept supplemental entries through this week. – Gal Factor (Hip 441): Four-year-old filly is a half-sister to last year's Grade 1-placed 2-year-old filly Boujie Girl, and from the immediate family of G1 winner Heir Kitty. Consigned as a broodmare prospect by South Point Sales Agency, agent. – Vicki T (Hip 444): Four-year-old daughter of Street Sense is a half-sister to G1 winner Zipessa, and from the immediate family of G1 winners Perfect Soul (IRE) and Flashy Bull. Cataloged as a broodmare prospect by Ballysax Bloodstock, agent. – Silver Diva (Hip 461): Five-year-old mare is a stakes winner at two, and hails from the immediate family of G1 winner Rutherienne. Consigned as a broodmare prospect by James B. Keogh (Grovendale), agent. – Basedonatruestory (Hip 464): Winning five-year-old daughter of Broken Vow is carrying her first foal by leading sire Into Mischief. She is a half-sister to Peace, a graded stakes placed 3-year-old of last year. Consigned by Legacy Bloodstock, agent. – Babybluesbdancing (Hip 466): Five-year-old daughter of Sky Mesa is a multiple stakes winner and graded stakes placed earner of more than $327,000. She is consigned as a broodmare prospect by James B. Keogh (Grovendale), agent. – Oops Times Two (Hip 470): Young broodmare is a half-sister to multiple G1 winner and promising young sire Practical Joke. She is consigned by Scott Mallory, agent. – Warranty (Hip 473): Registered Florida-bred finished third in Millions Filly and Mare Turf Preview Stakes at Gulfstream Park West in her most recent start. A half-sister to multiple stakes winner Imprimis, she hails from the immediate female family of G1 winners Miss Shop and Power Broker, and graded stakes winner Trappe Shot. Consigned as a racing/broodmare prospect by Bluewater Sales, agent. – Taking Aim (Hip 476): Four-year-old filly is a three-quarter sister to Breeder's Cup Dirt Mile winner and G1 sire Tapizar, and from the immediate family of G1 winners Olympio, Pyro, Cuvee, Untapable, and Paddy O'Prado. Consigned as a racing/broodmare prospect by Gainesway, agent. 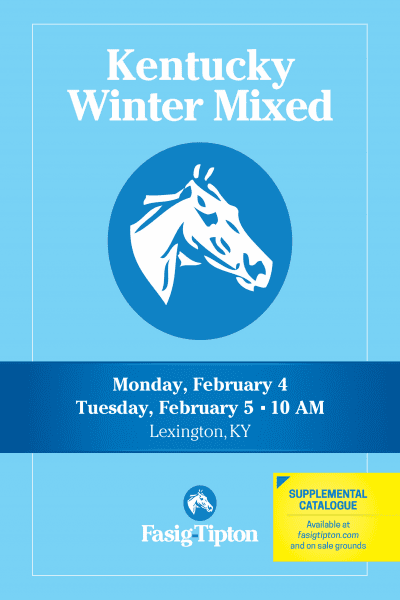 The Kentucky Winter Mixed Sale will be held on Monday and Tuesday, Feb. 4-5, in Lexington, Ky. The supplemental catalog will be offered on Tuesday, Feb. 5, following the conclusion of the main catalog. Print versions of the supplemental catalog will be available on-site at Fasig-Tipton. The supplemental catalog will also be available via the equineline sales catalogue app. This entry was posted in Bloodstock and tagged Babybluesbdancing, Basedonatruestory, fasig-tipton, fasig-tipton kentucky winter mixed sale, Gal Factor, Oops Times Two, Silver Diva, supplemental catalog, Taking Aim, Vicki T, Warranty by Edited Press Release. Bookmark the permalink.